Please Note: This title has been replaced by MTG 362 and 363. A much more comprehensive video set, you will learn the form far better with these. But this original title is still offered for those who wish to see it. 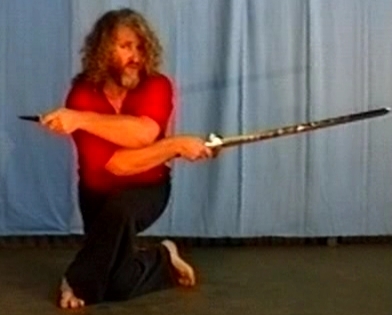 This is how the sword form was done at an advanced level, with a small knife in the other hand, the one that normally holds the "knife fingers". The knife was added later so that the beginning student would not cut his fingers off! Both forms are shown, beginners and advanced "sword/knife" form. The more normal form without the knife is taught first, then the whole form is taught using the knife, when to bring it out and when to conceal it. Some interesting training exercises to gain dexterity are also shown. If you are at all interested in the Taijiquan sword form and have already learnt the basic form, then this one will open your eyes to the real thing! This form is a brutal fighting form with all of the fighting techniques aimed at dim-mak points.